Quick! 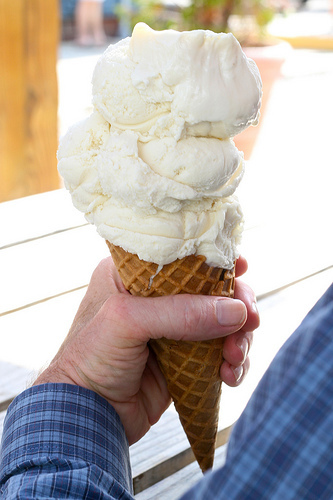 What's large and vanilla and a late summer treat? It’s the last week of summer, and while one might expect business development pros would have turned on their out-of-office auto-replies, the drug industry’s execs were too busy closing deals to be bothered with the beach or other lazy summer pursuits. We should have known biopharma’s summer had ended early the moment Amgen Inc. and Onyx Pharmaceuticals Inc. announced they had finally negotiated a takeover Aug. 25, before the market even had a chance to wake up Monday morning. The deal left us wanting in some regards: no cliff hangers, juicy tidbits or surprise white knights emerged. But while nothing about Amgen’s acquisition of Onyx astonished (not the buyer, the seller, the rationale or even the final $125 per share purchase price, which ultimately landed squarely in the middle of where most industry watchers thought it would), biotech mega-deals just don’t happen every day. We couldn’t help but get excited about it, especially wondering how significantly the addition of Onyx will impact Amgen's ambition of becoming a leading oncology player. The acquisition price of $10.4 billion makes Onyx Amgen’s largest acquisition in over a decade. The amount is $800 million less than the staggering $11.2 billion Gilead Sciences Inc. paid for Pharmasset Inc., a deal that had everyone talking in 2011. Unlike Onyx, Pharmasset had no commercial products, but presented an opportunity to transform Gilead with its potential best-in-class hepatitis C drug. Onyx may not end up being as transformative to Amgen’s top-line over the long-term as Pharmasset could be to Gilead, but the merger is still a notable moment in biotech and it will go a long way toward raising the industry’s 2013 merger stats, which were stark before high summer kicked into gear. In addition to Amgen/Onyx, the busy summer deal sweep included two biotech acquisitions by Cubist Pharmaceuticals Inc. in the antibiotic space and Perrigo Co.’s takeover of Elan Corp. PLC. Those four deals gave a significant boost to the 2013 tally of U.S. public biotech acquisitions, which was in a drought for the first six months of the year. All-in-all, six U.S. public biotech acquisitions with a value over $100 million have been announced in 2013; four of those took place in July and August, according to Elsevier’s Strategic Transactions database. In comparison, there were a total of seven U.S. public biotech take outs announced in 2012 and six in 2011. The hefty values of Amgen/Onyx and Perrigo/Elan lifted the average deal value in 2013 to $3.51 billion, well above the average deal value of $2.07 billion seen in 2012. Excluding those two mega-deals, however, the average deal value through August would be a comparatively meager $592.5 million. The four remaining biotechs that have been acquired play in niche commercial markets like antibiotics (Trius and Optimer) or fish oil (Omthera). In comparison, of the seven acquisitions announced in 2012, five were valued at over $1 billion, reflecting more acquisitions in broader commercial markets like cancer, diabetes and autoimmune disease. MedImmune/Amplimmune: Integrating Amplimmune Inc. into AstraZeneca PLC’s MedImmune LLC subsidiary shouldn’t be too much of a headache. The companies are neighbors in a Gaithersburg, Md., office park. Maybe it was only a matter of time before this deal got done. AstraZeneca, vaulting for a business turnaround, has been on a quest to fix its problems through business development. Its acquisition of Amplimmune for $225 million, announced Aug. 26, will bring the company an anti-PD-1 antibody for cancer nearly ready for the clinic. Privately held Amplimmune’s shareholders also could earn up to $275 million in development milestones as part of the transaction, expected to close during the third quarter. The milestones mainly will be tied to AMP-514, which should be ready for an IND filing in October. The acquisition offers a healthy return on investment for Amplimmune’s shareholders. The company was founded in 2007 with a $20 million Series A round from InterWest Partners LLC and the Wellcome Trust. Since then it has financed its operations with a pair of deals. In 2010, it got $23 million upfront from GlaxoSmithKline PLC for exclusive worldwide rights to AMP-224, an Fc-fusion protein of the B7-DC ligand now in Phase I/II study in cancer. Earlier this year, the biotech licensed the Phase I-ready B7-H4 fusion protein AMP-110 for autoimmune indications to Japan’s Daiichi Sankyo Co. Ltd. for an undisclosed option fee and research funding. AMP-514 is the key to the transaction, but MedImmune also values Amplimmune’s preclinical molecules targeting the B7 pathways. -- J.H. Sangamo/Ceregene: Gene therapy developer Sangamo BioSciences Inc. is strengthening its expertise in the field with the addition of Ceregene Inc.’s adeno-associated virus technology platform. The company announced plans to acquire Ceregene in a stock transaction Aug. 26; Sangamo will issue 100,000 shares to Ceregene shareholders. Sangamo has also agreed to pay milestone payments related to the two Phase II programs that Ceregene brings. The lead program, CERE-110, uses AAV technology to deliver nerve growth factor (NGF), a naturally occurring protein that maintains survival of nerve cells, to the region of the brain that contains the majority of cholinergic neurons. The goal is to restore and preserve nerve function in an area of the brain thought to play a significant role in cognitive function and memory in patients with Alzheimer’s disease. A Phase II study of the drug is expected to report out in 2014. -- L.L. Meda/Acton: Swedish specialty pharma Meda AB is buying Acton Pharmaceuticals Inc. to get the privately held group’s Aerospan inhaler for treating asthma, approved by FDA in September 2012 and poised – pending satisfying further manufacturing requirements – for a U.S. launch in early 2014. Meda, which describes itself as the world’s 50th largest drug company, is paying $135 million plus a potential milestone payment of $10 million and royalty based milestones to buy the Marlborough, MA-based company. The Swedish group has its own respiratory portfolio and views Aerospan, which contains the active substance Flunisolide, as a promising addition in its quest for share of the $2 billion U.S. market for inhaled mono-corticosteroid asthma products. Meda aims to close the takeover by the end of 2013, and predicts Aerospan under its guidance will generate at least SEK2 billion ($300 million) in revenue within five years. A respiratory-focused development company with no products yet on the market and only nine employees, Acton was founded in 2008 and is owned by private equity group Sequoia Capital and the group’s executive management. A perpetual licensing agreement with Forest gives Acton exclusive global rights to develop and market Aerospan. Acton also has exclusive U.S. rights to Sanofi’s FDA-approved aerosol nasal allergy treatment Nasacort HFA (triamcinolone acetonide). Neither Meda nor Acton would comment on what the takeover of Acton would mean for that arrangement. -- S.S.
flickr image courtesy Chiot's Run under creative commons license. Holy ice cream headache, batman.